are sold Just as Greens was at the forefront of the new American cooking, offering food that was not merely meatless, but delicious, stylish, and closely tied to local ingredients, The Greens Cookbook introduced the idea of seasonal eating, the use of heirloom vegetable varieties, plenty of fresh herbs, and the new and daring chipotle chile. It was my first cookbook and is still in print after more than twenty years. 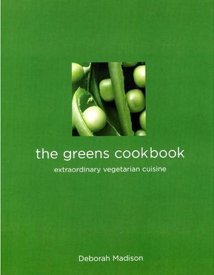 The Greens Cookbook was written so that the reader could duplicate the food tasted at Greens. When someone made a meal for me cooked entirely from the book, I knew it had succeded. Probably the best known recipe (and most copied one) is the Black Bean Chile. After so many years, it still sings. The Greens Cookbook was nominated for a cookbook award by the International Association of Culinary Professionals (IACP) and winner of the Andre Simon Memorial Prize.